Turmoil in the world’s newest country. On a hot evening in March, with the temperature still over 100 degrees, I met a veteran journalist named Jacob Akol in South Sudan’s capital, Juba. South Sudan is the newest nation in the world, and it shows: Juba is expanding so quickly that it basically reinvents itself every month. Hotels and offices are constructed out of used shipping containers. Dirt roads alter their course overnight, diverted so that people can claim uninterrupted plots of land. Since 2006, Akol has been the editor of Gurtong Trust—a local publication that offers reasoned arguments about the future of South Sudan—but he has covered Sudan since the 1970s. He suggested that I come to a happy hour at Central Pub, one of the few places in the capital that attracts both locals and expats. As I neared the bar, my cell phone service cut out—a common occurrence in a city still struggling to provide basic infrastructure. I circled the crowded thatched-roof patio area until I found Akol and a table of friends animatedly discussing the day’s headlines. Then, on April 9, South Sudan’s problems got even bigger. Claiming that the Sudanese government was using the oil-rich border region of Heglig as a staging ground for attacks on South Sudan, Juba seized the area. Though the border between Sudan and South Sudan is still hazy, Heglig is generally considered part of the North. South Sudanese forces held Heglig for more than a week—drawing criticism from a host of their usual allies, including the United Nations—before withdrawing. Following the withdrawal, Sudanese President Omar Al Bashir responded by reportedly dropping eight bombs on South Sudanese territory on April 24 and killing 16 civilians. South Sudan’s president, Salva Kiir, stated that Bashir “declared war” with those bombs. Akol told me that the South Sudanese understand the potential consequences of this antagonism. People are clamoring “to settle permanently,” he told me. “They wouldn’t want war anymore.” Nevertheless, it now appears possible that a country facing no shortage of other challenges could spend its upcoming first birthday fighting for its own survival. THERE HAS BEEN consistent fighting between the North and South ever since the British pulled out of Sudan in 1956. The South launched a rebellion against the central government in 1983, which turned into Africa’s longest civil war. An estimated 1.5 million people died in the fighting. In 2005, the two sides finally signed a comprehensive peace agreement ending the conflict and giving Southerners the right to hold a vote on secession. Nearly 99 percent of the people who voted in the 2011 referendum chose to form a separate country. When the South officially seceded from Sudan in July 2011, it retained at least 75 percent of the known oil reserves in the area. But it depended on Sudan’s pipelines to transport the crude to the Red Sea. A disagreement over fees ensued. Khartoum wants to charge as much as $32 for each barrel of oil that passes through its pipeline; Juba is only prepared to pay $1 per barrel. Unable to work out an agreement, the South simply turned off the oil in January and denied Sudan any revenue. But, in doing so, the South also cut off 98 percent of its own income. By the time I arrived in March, the effects of this decision were visible. Long-term projects in health care, education, and other services had been shelved as ministries discussed austerity budgets and scrounged for resources. One health official told me any construction on hospitals or other health care units that hadn’t already started wasn’t going to happen in 2012. A few weeks after my meeting with Akol, the minister of electricity and dams announced that Juba could expect total blackouts, as the government was unable to buy the fuel it needed to power streetlights or buildings hooked up to the grid. The United Nations estimates that 4.7 million people in South Sudan won’t get enough food this year. The northeastern state of Jonglei is expected to be particularly hard hit by food shortages. Meanwhile, the state is also struggling to contain persistent ethnic violence. While South Sudan’s conflict with Sudan gets more international attention, ethnic tensions within South Sudan probably pose nearly as big a threat to the country’s long-term stability. Most of the attacks that have occurred since independence have taken place in Jonglei, where columns of warriors crisscross the state, executing raids and counter-attacks that have left thousands dead. The violence has gotten so bad that some local government officials told me they wanted to hand the state over to military control. “Forces [need] to remain in Jonglei state for a period of no less than three years,” Kuol Bol, a representative in the state assembly, told me. The basis of South Sudan’s tribal conflict is ostensibly cattle, which serves as currency among the country’s pastoral groups. Historically, cattle raids have been an expected part of life. Now, with livestock diseases spreading more rapidly and dowry prices—traditionally paid in cows—rising, healthy cattle are more valuable than ever and the raids have become increasingly violent. Some have accused Khartoum of arming various ethnic groups in a bid to destabilize South Sudan. But, discounting the alleged Sudanese intervention, there are plenty of catalysts for violence; jobs and resources are scarce. Just before Christmas last year, the Lou Nuer tribe carried out an attack on the Murle tribe that displaced at least 60,000 people. 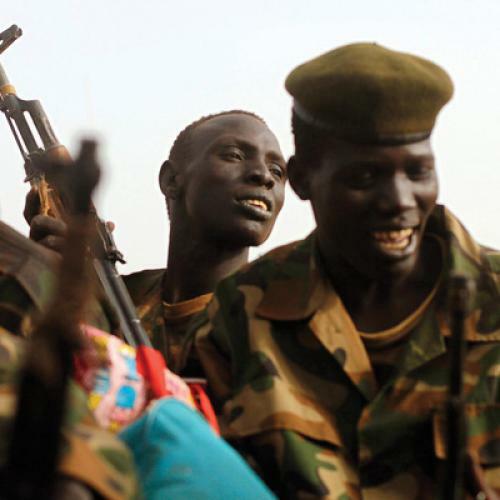 In January, the Murle responded by killing 23 Lou Nuer. In recent months, Murle raiders have turned to ruthlessly kidnapping the Dinka Bor tribe’s children, then selling them for cattle or raising them to protect Murle villages. I trailed the troops a few weeks after their arrival, spending five days around Bor to get a sense of whether the government’s efforts had helped. Like much of South Sudan, Bor is a hot, dusty place in the dry season. There are hardly any trees, which makes it worse; the trees were chopped down by Sudanese forces so they could better see the enemy approaching, my translator told me. Aside from some government buildings and a few hotels, there’s little development. Lony told me the people here live a “wild life,” but the most activity I saw was some good-natured chatter at the local market. In Makuach, a town on the outskirts of Bor populated almost entirely by members of Dinka Bor, I met with Philip Duot Jok, the local commissioner. A tall, thick, and strikingly soft-spoken man, Jok lives in a compound at the end of the main road. When I asked him about the violence, he pointed to a spot a few feet from the gate to his house where raiders recently killed one local woman. He then stood, scanned the dusty vista, and pointed at a half-dozen more places where similar incidents had occurred. In the month I spent traveling across South Sudan, fear was the constant refrain—fear of the North, fear of neighbors, fear of landmines, fear of hunger. I thought back to the hopeful mood that had characterized my evening at the Central Pub with Akol and his journalist friends. As the sun descended, the whining of generators kicked in. Aside from the hotels and restaurants that could afford the increasingly expensive generator fuel, the city would soon be dark. As the night wore on, the journalists at my table swapped stories about the independence-eve parties they attended last July. The consensus was that Juba has never seen a wilder night. Not before—and certainly not since. “We couldn’t celebrate forever,” Akol told me. Looking back, it seemed to me that they hardly got to celebrate at all. Andrew Green is a writer based in Kampala, Uganda. He reported from South Sudan on a fellowship from the International Reporting Project. This article appeared in the May 24, 2012 issue of the magazine.